Provide toys. One of the easiest ways to make a cat happy is with a new toy. Not all toys have to be store bought. Paper sacks, wadded up paper and empty boxes will entertain cats for hours. Train your cat together. Cats are smart as well as food oriented and can be trained to do fun tricks–the mental and physical stimulation is great for felines. Training your cat can strengthen the bond between you and your feline buddy. Make your cat work for food. Feline obesity is a huge problem in this country and one way to combat it is to make cats work for their food. Food toys are available to channel a cat’s natural hunting instincts. The toy releases kibble in small amounts as the cat play with it. Another option is to hide a cat’s food in different places so that they have to find it. Acclimate your cat to the carrier. Many cat owners find that the worst part about taking their cat anywhere is getting it into the carrier. The time to work with your cat on making their carrier seem like a safe, secure and inviting place to be is prior to veterinary visits or family vacations – not when you’re ready to get into the car. Visit www.catalystcouncil.org to view Cats and Carriers: Friends not Foes for tips on how to get cats to love their carriers. Visit the veterinarian. Healthy cats are happy cats. Many veterinary practices are cat friendly or have doctors who specialize in cats. Yearly wellness visits can help catch medical problems early. Microchip your cat. In addition to a collar and identification tag, microchipping provides permanent identification in case your cat becomes lost. Go outside (appropriately). Yes! There are ways owners can safely take their cats outside to allow them to broaden their horizons. Cats can be walked on a leash with a harness or confined in a special outdoor area—always under supervision, of course—so they can periodically and safely experience the world outside their window. Provide proper scratching posts. Scratching is an important aspect of feline behavior. Cats should have places they are allowed to stretch and care for their claws. Providing a long and sturdy scratching post in a vertical, horizontal or angled position is a good way to keep your cat happy. Provide preventive medications. No one likes fleas, ticks, mites or heartworms, especially your cat. Even if your cat is kept strictly indoors, they can still be attacked by these little creepy creatures. A parasite-free cat is a happy cat and preventive care will keep your family healthier, too. Think about getting another cat. Cats are social animals, so you might want to consider visiting the shelter and adopting a best buddy for your current kitty. Cats love to play, and a playmate will make them happy—provided they are properly introduced and have the right places to eat, hide, play and go the bathroom. 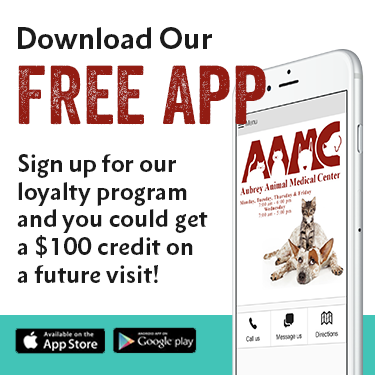 Aubrey Animal Medical Center supports the Veterinary Care Charitable Fund. If you would like to make a personal donation or learn more about their organization, please click on the links below. Copyright 2018 Aubrey Animal Medical Center. All Rights Reserved.